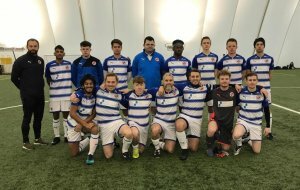 Reading FC Deaf Teams are in action this weekend. Home News Reading FC Deaf Teams are in action this weekend. It’s going to be a busy weekend for STAR sponsored Reading FC Deaf with games on both days. On Saturday 23rd March we are home to Bristol City at Ryeish Green Sports Hub, Hyde End Road, RG7 1EP, kick off 2pm. With no Reading FC 1st team games why not come down and cheer us on in the 2nd Round of the EDF South League Cup. On Sunday 24th March it’s going to be even busier with two teams playing away from home. Team A will be playing in Round 2 of the BBC Get Inspired FA People’s Cup. We will be travelling to Kempston Rovers FC’s Stadium, Hill Grounds Road, MK42 8SZ. This is a nationwide 5-a-side competition. Last year we played in the final of this competition. First game kicks off at 2:30pm. Team B will be playing in Round 4 of the BOBi League at Oxford City FC Stadium, Marsh Lane, OX3 ONQ. This a 7-a-side competition. Last year we won this league. Come and cheer us on or wish us luck. All games are free to watch.